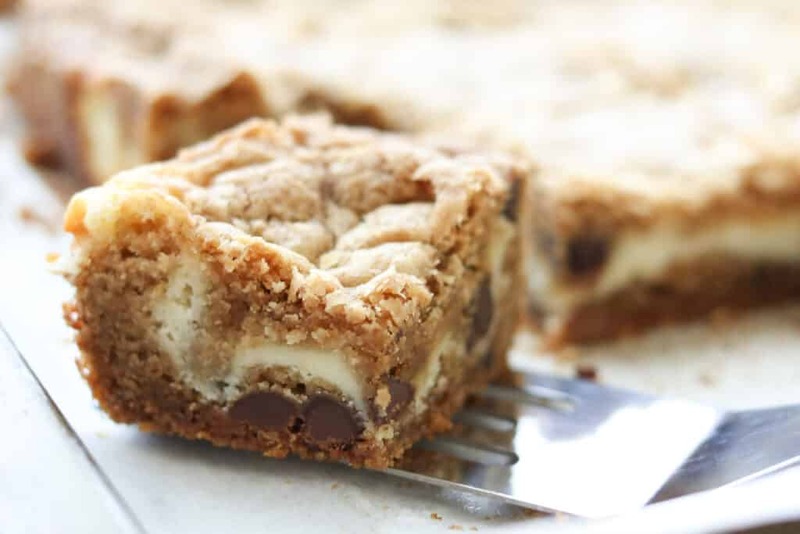 Caramel Chocolate Chip Toffee Cheesecake Cookie Bars, as if the name wasn’t more than enough, just imagine each of those ingredients on their own and now picture them all stacked into the ultimate cookie bar with a perfect layer of creamy cold cheesecake in the center. No joke, these bars are amazing. I first saw them here and I couldn’t get them out of my mind! One bite, just one bite, is all it took to know that I couldn’t keep these in the house. I immediately sent half of them to the office with Sean, shared a few with the family, and dropped the remaining bars off at a friend’s house. 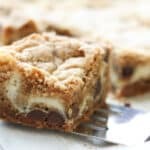 These are crazy good and I can’t wait for an excuse to make them again. (I know better than to make them when I’ll be left alone with the whole pan!) 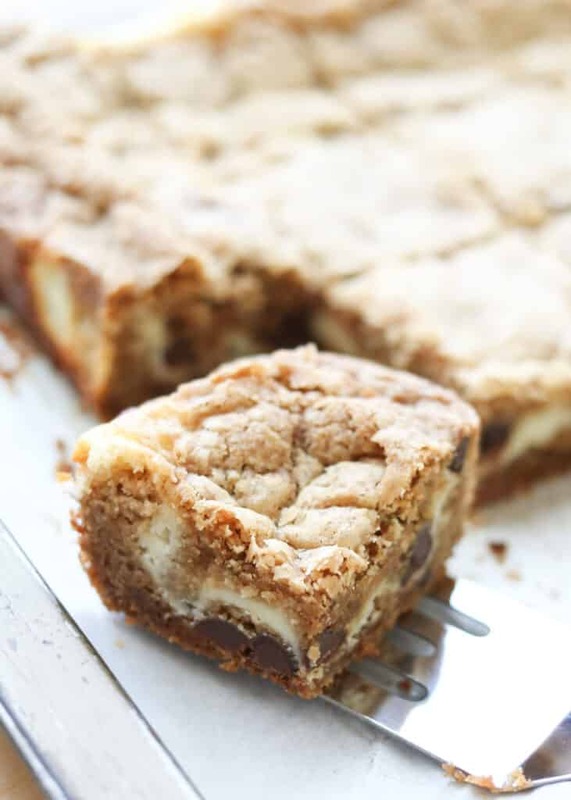 These bars are an awesome potluck or party treat, perfect for sharing with friends. 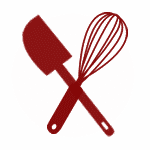 Check out all of the Gluten Free Dessert Recipes on this website. For a low carb treat that everyone will love, try these Magic Cookie Bars too! Beat together the cream cheese and sugar until smooth. Add the egg and vanilla and beat again until completely smooth. Pour the cheesecake layer over the cookie crust in the pan. Use your hands to press chunks of the remaining cookie dough into flat discs and layer them over the cheesecake filling. Don't stress making it look perfect or covering the entire pan. Bake for 28-33 minutes, just until the bars are cooked through and the top has lightly browned. Allow them to cool completely, before lifting them from the pan with the parchment paper. Slice into bars and store in the refrigerator. Enjoy! These look so wonderful, Mary. I love cream cheese and chocolate and I love the idea that it's gluten free since I'm trying to expand my collection of gluten free recipes. Hi Mary. These look amazing but do you have a suggestion about an alternative for tapioca? It doesn't agree with my tummy :( But I really wanna make these!! You can sub cornstarch or simply increase the potato starch. The texture won't be exactly the same, but it should still work. I hope you like them as much as we do! I I use an all purpose gluten free flour mix instead of the brown rice flour and starches? I've never done that, but it's certainly worth a try. I've found that some recipes adapt well with flour mixes and others simply do not. Unfortunately, they aren't predictable. If you try it, definitely let me know how they turn out! I have not seen caramel bits and do not have time to go looking for them.. is there something else I can use? I made these yesterday and they were a HUGE hit! These are amazing! I substituted gluten free white flour and coconut sugar instead of the white and brown sugar and it turned out perfect. Make these, you won’t be sorry that you did. So glad you liked the cookie bars, Roe!